Beth Ratzlaff is an ordinary clay-pot woman who is being crafted by an extraordinary potter, God. She blogs about spiritual formation and writes in other capacities. She also serves as a spiritual director and works with Get HOPE Global, a ministry that provides Christian business training curriculum and microloans to women in impoverished countries. She loves international travel and speaking. She spent years as an educator, helping to found, and then working in various capacities, at a Christian School. She is a wife, mom, and step-mom. She also loves to read, learn, play, run away to the mountains or overseas whenever possible, dream big dreams, and see those dreams become realities. IF YOU’VE BEEN WAITING ON YOUR DREAM FOR WHAT FEELS LIKE FOREVER, THIS IS THE EPISODE FOR YOU. 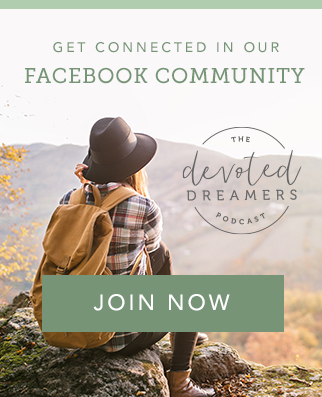 In this episode, Beth talks about the long years she has waited on her dream to be a writer, how God has grown her through the pain of life and through waiting on her dream. She also shares the 5 promises from scripture she uses daily to draw closer to the Lord. I know you’re going to love hearing her story, especially if waiting is a part of yours. Want to chat more about today’s show? Use the hashtag #DreamerChat67 to share your thoughts wherever you like to hang out online. If you need a question to spark the conversation, here’s one for you: What has God taught you through pain or waiting? Get Beth’s soul training exercises from Isaiah 66. Just visit her website and scroll down to “Get New Posts in Your Inbox” and enter your email address.